Just after Christmas I decided to buy a new camera. My point-and-shoot camera (an Olympus SP-590UZ) was good, but I wanted better control, the ability to change lenses, and larger megapixels for taking photos of my artwork for prints. After looking at the specs. between a Canon Rebel T3i 600D and a Nikon D5100, I decided on the Canon Rebel. While it's true that it's not the camera, but the photographer, that determines a photos outcome, it sure doesn't hurt to have a good one from the start. I love it and am thrilled to find many tutorials online that help me discover the photographer in me. Can't wait to use it when we go to Florida again this Spring. It already was worth the price for how clear the photos came out for some of my fantasy paintings. 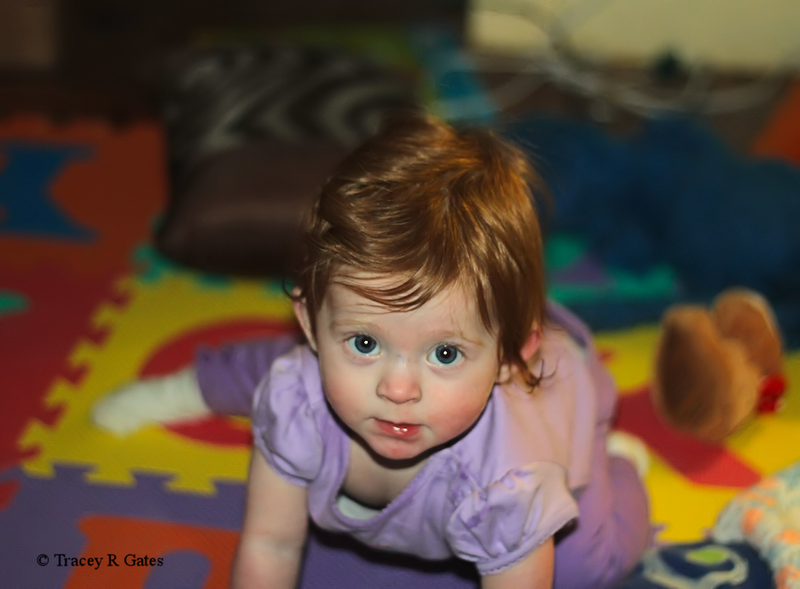 Look at this photo art of my darling granddaughter, Emma. I did this with a 18-55mm lens with settings to focus on her and make everything else around her slightly blurred. The room was dark with one lamp on. The only change I made in my software was to shrink the size. Not too bad for one of my first tries with the camera. Of course, it helps to have a good subject to photograph. A couple days ago I stumbled across a forum discussion about HDR (High Dynamic Range). Another thing I bought around last Christmas was Paintshop Pro X4. I've been a big fan of Paintshop since version 5 while it was still created by Jasc. Yet, I didn't realize there was HDR on some of the other versions I owned until running across the discussion. It piqued my interest. So, I just had to go outside, in the 30 degree weather, and test out my camera's functions for this. As what seems to be the usual now for this time of year in upstate New York, we had grey skies. My fingers were freezing, but I was able to get a few nice photos of the clouds with a hint of sun using the Auto Exposure Bracketing (AEB) setting. [Note: It's not a good idea to aim your camera directly at the sun. For the safety of the camera and your own eyes.] AEB on the T3i takes three photos of the same shot, but with different exposures ranging from underexposed, normal, and overexposed. One will be full of detail, but not enough light. Another will have plenty of light/brightness, but not much in the way of detail. Then there is the normal shot in between that is a mixture of both. Once I had the photos I wanted, I transferred them to my computer and opened up PSP. Without going into full details since there are tutorials for this all over the internet, I opened the photos under HDR, merged them, and played with the different settings until I found an image I liked. I also added a little bit more color to it to make it more painterly... Artsy. The result is the "Mystical Sky" clouds digital art you see at the beginning of this post. It's probably a bit simple and not what HDR experts would be excited about, but I like it and am planning to get a print of experimental photography art to put on my wall. My first love is traditional pencil, watercolor and acrylic art, but I also enjoy photography and see it as an add on to my artistic creativity.